What’s the best way to market to Truckers and others in the Trucking Industry? Aside from running ads in Trucking Magazines and hoping the ads are seen, advertising is done within Truck Stops. The problem with each of these approaches is that they are very limited in how many people might buy a particular magazine, or how many Trucks might pass through specific Truck Stops in specific areas. 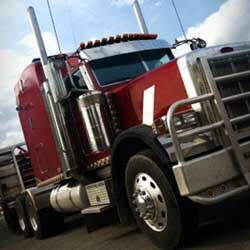 A better approach is to place ads on the wide range of Trucking related websites online. These sites draw very specific individuals from all over, and these specific individuals are either Truckers or others in the Trucking Industry. By focusing attention on sites that draw large numbers of people working in the Trucking Industry, advertising isn’t limited to those who decide to purchase this magazine or that magazine, nor is it limited to the finite geographic locations of individual Truck Stops. It is the rare Trucking website that charges a fee to access the site, so advertising is the primary revenue generator for most Trucker related website Publishers. By placing the Niche Ad Network Trucking Channel Ad Zone within their sites, Publishers can be assured that Trucking related ads are displayed to their site visitors. Not only does this enhance the look of the site by maintaining the overall theme, but it puts products and services that might actually be of interest to those visiting the site. And by matching the theme of the site to the theme of the ads, it increases the likelihood of click-throughs, which generates revenue for the Publisher. What if magazines only charged Advertisers if a magazine was purchased by a Trucker and an ad was actually seen? What if Truck Stops only charged Advertisers when a Trucker stopped and stared at an ad in the Truck Stop? The beauty of the Niche Ad Network Trucking Channel Ad Zone is that Advertisers are ONLY charged when their ads are clicked on within Trucking related websites. Imagine that. Create a targeted ad for those in the Trucking Industry, and then have it distributed to numerous Trucking related websites, and only pay when someone actually finds it of interest and clicks through. This approach is a win/win/win! The Publishers win. The Advertisers win. And the visitors to Trucking related websites win.